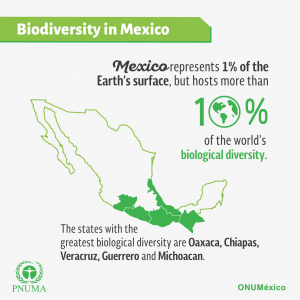 Mexico is one of the most megadiverse countries of the world.Although the Mexican territory represents only 1% of the earth's surface, it hosts more than 10% of the world's biological diversity (CONABIO, 2014). Thanks to its geographic location and formation, Mexico presents a great diversity of ecosystems, such as: temperate climate, tropical ecosystems, aquatic ecosystems, freshwater life and coastal and marine ecosystems. 30 to 35% of the national territory is covered by forests, jungle or other types of vegetation, and according to a study by FAO, Mexico ranks 12th in terms of global forest area. In addition, many of the species in Mexico are endemic, which means native to the Mexican territory. Between 50% and 60% of the known species of plants of the world are represented in Mexico. The states with the greatest biological diversity are found in the south, with Oaxaca being the biodiverse-richest State, followed by Chiapas, Veracruz, Guerrero and Michoacán (INECC, 2007). The Mexican population directly or indirectly depends on nature, through agriculture, fisheries, and/or tourism (among others). Likewise, the main economic sectors of the country depend on natural resources for their productions, such as on water, mineral resources and forests, among others. The economic growth is dependent on natural resource use, something that can hardly be considered sustainable in the long run. Furthermore, this dependency results in the net loss of natural capital. The National Geographic and Statistics Institute (INEGI) calculated that Mexico lost 35% of its forest cover in the past 20 years (INEGI, 2014). Furthermore, the natural availability of water (measured per capita) in Mexico has continued to decline and 126 out of 653 Mexican aquifers present conditions of overexploitation (INEGI). According to the National Fisheries Charter 2012 (Carta Nacional Pesquera, 2012), 75% of the fisheries units of the Pacific are deteriorated or at their maximum sustainable fishery level, while in the Gulf of Mexico and the Caribbean Sea these percentages are even higher, at 92% (Intersectorial Commission for the Sustainable Use of the Sea and the Coasts, (Comisión Intersecretarial para el Manejo Sustentable de Mares y Costas, 2012). Furthermore, 2,606 species are in danger of extinction, threatened or subject to special protection (Norma Oficial Mexicana 059, SEMARNAT, 2013). The effects of climate change (50% of the vegetated surface of the country is vulnerable to the impacts of climate change (CONAFOR, 2012). According to INEGI, the total costs of environmental degradation in 2015 amounted to 5.7% of the national GDP- which is more than the annual economic growth rate and thus suggested a “negative” growth for Mexico if environmental degradation was included in the equation. Among the sectors contributing most to the costs of environmental degradation are energy, transport, mining, agriculture, forestry and fisheries – sectors that are at the same time directly dependent on ecosystem services. The invisibility of the value of nature in political and economic decision-making and policy planning in the public and private sector is one of the main reasons for the continuous depletion of ecosystems and biodiversity. Oftentimes, the services provided by ecosystems are not considered in decision making by different stakeholders, causing various symptoms of degradation and depletion of distinct natural capital stocks. Under the economic, social and environmental perspectives, Mexico does not only require to grow, but to grow in a more inclusive, sustainable manner in order to provide a good quality of life to all of its inhabitants. Growing within a Green Economy would make it possible to break the vicious circle of poverty and environmental degradation that hinders a large share of the population to fulfill their economic potential and, with this, increase the productivity required by the country for a sustainable development. However, Mexico has made progress in recognizing the role of natural capital stocks in its economic development. 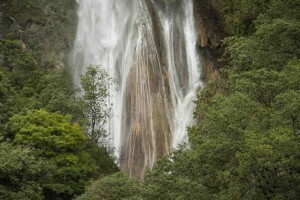 The Government of Mexico has defined an ambitious agenda in the fight against climate change and the preservation its biological diversity, as highlighted in the National Development Plan 2013-2018 (Plan Nacional de Desarrollo 2013-2018), which explicitly included the term “green growth” as one of its main objectives and stressed the importance of environmental sustainability in its objective Prosperous Mexico”, highlighting the importance of "[...] promoting and guiding an inclusive green growth that preserves our natural heritage while generating wealth, competitiveness and employment" (DOF, 2013a). In addition, in the sector program of the Ministry of Environment and Natural Resources (SEMARNAT), PROMARNAT 2013-2018, defines the work program of the environmental sector in line with the National Development Plan. The promotion of low carbon growth and the importance of generating green jobs are, among others, stated as main priority areas for the time between 2013 and 2018. Furthermore, Mexico has also created and constantly improved its System of Economic and Environmental Accounting, regularly updates a national inventory of greenhouse gases; publishes the book “The Natural Capital of Mexico” (El Capital Natural de México) and adopted the General Law for Climate Change (Ley General de Cambio Climático) and the Law for Energy Transition (Ley de Transición Energética) in order to promote the legal framework for the protection of the environment. Moreover, Mexico has implemented several policy instruments for the preservation of biological diversity and its natural resources: Mexico has 181 federal Protected Natural Areas; schemes for the Payment for Ecosystem Services (PES) covering almost 3 million hectares of the national territory; and operates over 12,000 Units of Wildlife Conservation and Management covering around 39 million hectares (corresponding to over 19% of the national territory). 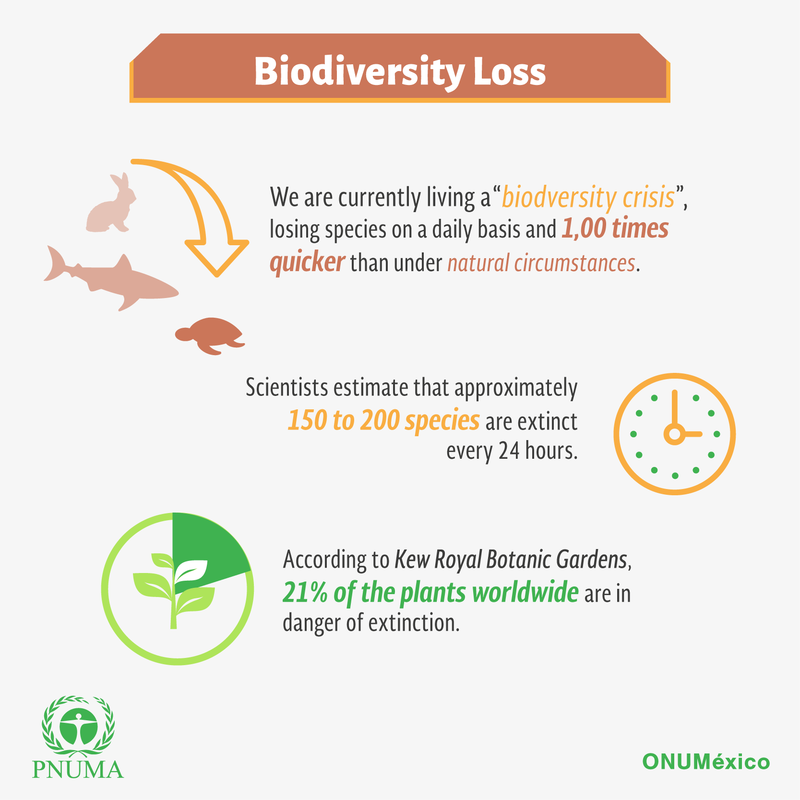 At the international level, Mexico has also been actively involved in monitoring and implementing the objectives of the Convention on Biological Diversity. 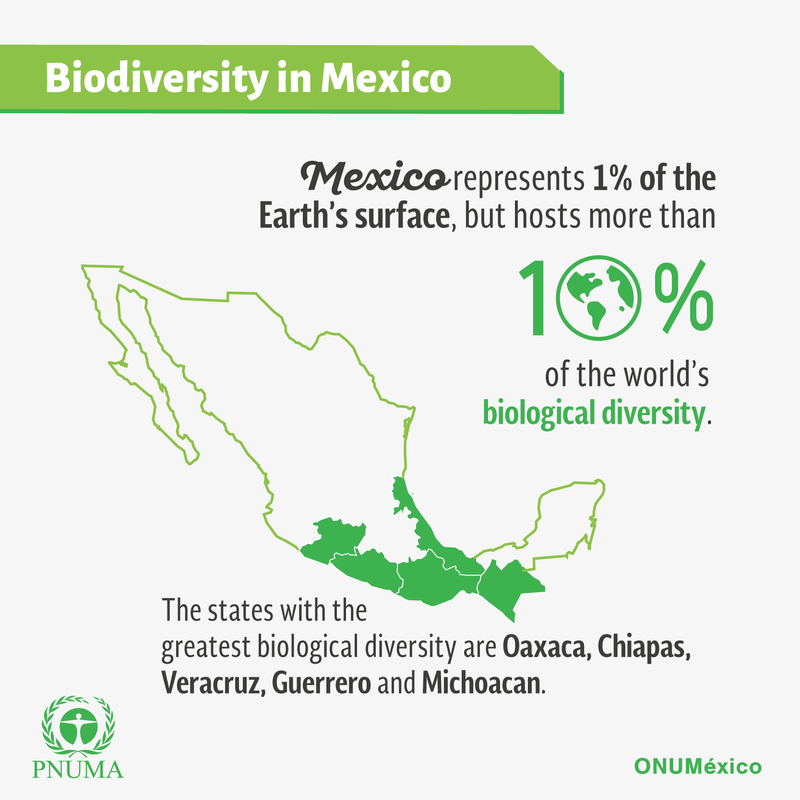 For example, as a megadiverse country, Mexico, in 2002, proposed the creation of the "Group of Like-Minded Megadiverse Countries", which led to negotiations and the adoption of the Nagoya Protocol. Mexico is a party to the Cartagena (signed on May 24, 2000 and ratified on August 27, 2002) and the Nagoya Protocol (signed on February 24, 2011 and ratified on May 16, 2012). 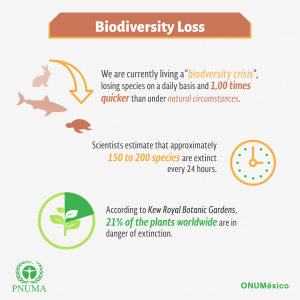 Mexico also hosted the 13th Conference of the Parties to the Convention on Biological Diversity (CBD COP13) in December 2016 in Cancun, with the motto "Incorporating biodiversity for well-being". Together with the other members of the Convention, Mexico promoted the ambitious agenda of integrating biodiversity into four sectors: agriculture, forestry, tourism and fisheries. The COP13 provided a unique opportunity to integrate ecosystem services into public policy and decision making, while contributing to policy coherence (Sustainable Development Objective, ODS 17.14) and the transition towards a green, more inclusive and sustainable economy. In this sense, the TEEB for Mexico Initiative is a tool to strengthen the above mentioned efforts of the Mexican government towards green and inclusive growth and contributes to the implementation of the recommendations of the world-wide, renowned Green Economy Initiative of UNEP. This initiative seeks to highlight the benefits of a transition to a green economy, increase public investment towards green sectors and demonstrate that a green economy would contribute to a higher rate of economic growth while at the same time combating poverty, improving social equity and preserving the country's natural capital.